The world is becoming increasingly urbanized. In 2008, humanity crossed a milestone – the urban population exceeded the rural population. By 2050, almost 70% of people will live in urban areas – that is 6.3 billion people! This poses significant challenges for sustainable development. Cities are responsible for almost 75% of the global resource consumption and they account for more than 70% of energy-related global greenhouse gas emissions. Cities are the arena where the battle for sustainability will be won or lost! Rapid urbanization offers opportunities for a faster transition to sustainability – e.g., through urban agglomeration, increased innovation and wealth. Municipalities can now act as leaders on sustainability issues – e.g., initiatives and interventions related to the development, repair or maintenance of the city. However, urban growth needs good governance structures for the transition to take place – e.g., urban governance experiments. There is a mutually impoverished situation in relation to the governance of city development. Ordinary city inhabitants do not have appropriate mechanisms for engaging in planning their environments and on the other side planners and policy-makers do not have practical access to qualitative, subjective data on how inhabitants use, know or experience the city. 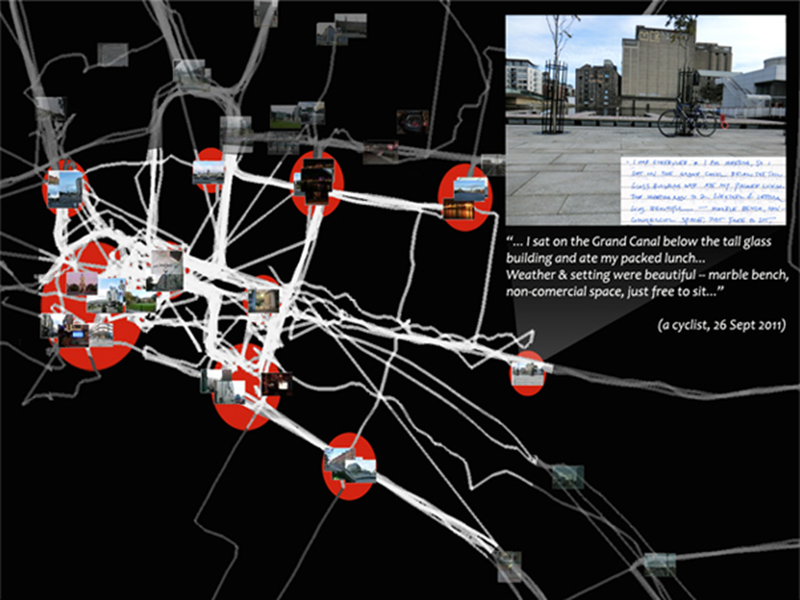 Dublin City (the case study) was mapped dynamically from a ‘bird’s eye view’ (quantitative stage, i.e. survey) to an ‘on-street view’ (qualitative in-depth stage, i.e. interviews and hybrid diary study, combining GPS-tracking, photography and text). Focus was placed on inhabitants’ movement, and their subjective experiences and knowledge of the city. Digital representations of these data form the basis of an interactive map-based digital platform – practical tool and citizen engagement framework. 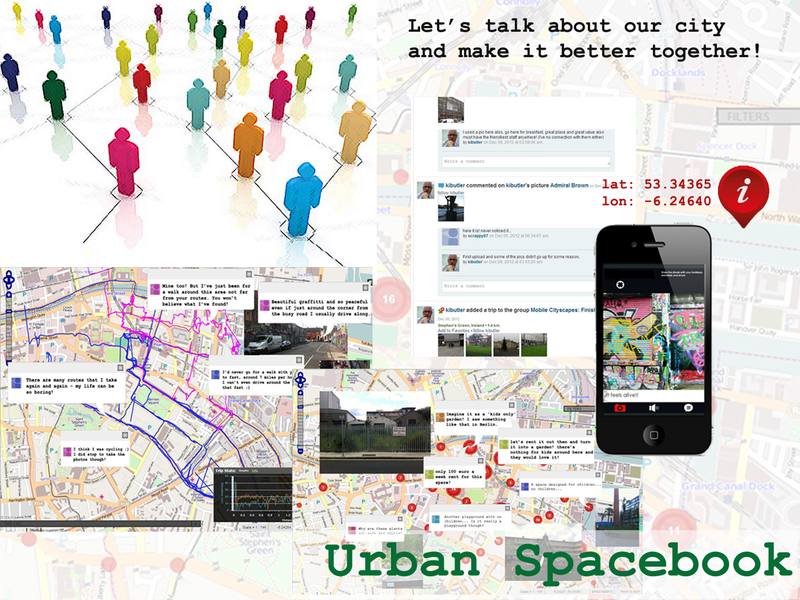 Urban Spacebook is a conceptual open-source Web 2.0 platform for geo-tagged user-generated content, merging aspects of social media with representations of movement. 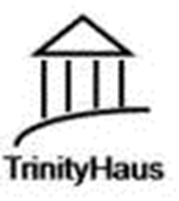 It provides a framework for citizen engagement and the collection of subjective urban data, which offers a space for ongoing and positive engagement between city inhabitants and planners and policymakers, through map-based interaction and data visualisations. This is a practical way of accessing inhabitants’ subjective interpretations and knowledge of the city. An even smarter city needs to take into account subjective urban data – e.g., experiences of movement. ICT can enable city-making and provide new governance spaces – e.g., by enriching everyday city experiences and offering opportunities for proactive citizen engagement.